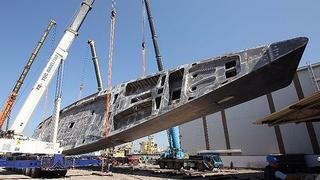 Perini Navi has recently turned the aluminium hull of their first 70m sailing yacht. Ordered in December 2011, she will become the second-largest sailing yacht produced by the Italian yard since Maltese Falcon. Currently known as hull number C.2227, this new series reveals new dynamic lines designed by Perini Navi in collaboration with Philippe Briand for the naval architecture and the sail plan. The few specifications available already sound impressive on paper: a gross tonnage of 850 GT, a retractable keel varying from 4.54m to 11.70m and two masts of 72m and 62m. The interior layout was conceived by the in-house team with decor by PH Design. It will accommodate 10 guests in a full-beam master suite, with office and lounge areas and four double guest cabins. The Perini Navi C.2227 will be delivered in 2015.